Aleksey Pushkov, political analyst, shared with RT his ideas about the future head of the Russian government and the Russian state. Russia Today: What does this resignation really mean for the Russian politics? 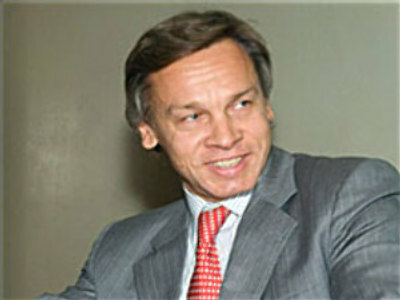 Aleksey Pushkov: I think it means that Vladimir Putin has decided to divide two key functions in Russian politics. There was a widespread belief that the person nominated for PM would be Putin’s successor. I think that today Putin has told Russia and the world that the person who has become the PM will not be his successor. From now on there will be two functions. RT: Why do you think he will not to be his successor? A.P. : That would surprise me very much. Mr Zubkov has been considered for resignation because of his age for a long time. Actually, under other conditions, he could have become a pensioner, not PM of Russia. He is virtually unknown to the Russian public and I think that Putin still wants to propose as his successor someone that the Russian electorate has some knowledge of. It would be, to my mind, very strange if the President presented someone as his successor who is virtually unknown to the nation. RT: What does this mean for the upcoming elections? A.P. : It means only one thing that the person who will be chosen as Putin’s successor will be busy with whatever he is doing now and with his electoral prospects. I believe this person will be announced sometime in December or January. Meanwhile, the PM will not be involved in the presidential elections and will guarantee the kind of stability Putin cherishes very much. I mean the government will be led not by the future president, who has to take part in the electoral campaign and to make populist moves and to make declarations and promises, but by a person who will just be running the government and will be not involved in the contest for votes at all. So I think that in doing this, Putin is giving us a stable government and, at the same time, maintains the intrigue around the issue of who will succeed him in the Kremlin.